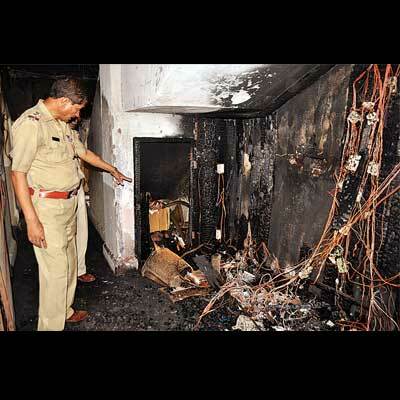 Three persons suffocated to death and eight others were injured after a fire broke out in the electrical meter cabin at Vaity Apartments in Mulund (East) on Wednesday night. According to the police, the victims —Varsha Pasad, 57, husband Vasant, 59, and Hema Chheda, 55 — were residents of third and fourth floors respectively and were coming down the stairs when they got trapped in the smoke and suffocated to death. Eight others are critical and are being treated for respiratory problems and burns.Residents said there had been several incidents of short-circuit in the electricity metre box of the 25-year-old Vaity Apartment on Chafekar Bandhu Marg in Mulund (East) but it was never addressed. The fire broke out around 1.30am resulting in heavy smoke that reached up to the top floors of the six-storey building. Fire brigade officials said the fire broke out around 1.44am and was doused around 2.18am at Vaity Apartment on Chaphekar Bandhu Marg. Four fire engines were rushed to the spot. “When the fire broke out in a meter box on the ground floor of the building, the residents were sleeping. In between, the electric wiring got burnt and the fire spread into the building up to the sixth floor,” said a senior official who was part of the fire-fighting operation. Dhansingh Thappa, the watchman who was on night duty there, said there was total chaos as residents were rushing to get out of the building, and those who couldn’t were screaming. “When the fire broke out on the ground floor of the building, the residents were sleeping. The fire was restricted to the electrical cabin and the passageway of the ground floor but there was a lot of smoke. The building’s electric wiring burned in the blaze and the fire spread to even the sixth floor. Most impact, however, was on the first floor,” said a fire official. “A student who was studying on the first floor heard a series of small explosions and raised an alarm. The smoke and flames were the thickest on the first floor,” said senior inspector Ganesh Gaikwad, Navghar police station.